 Publications of Agustí Chalaux. Life, work and thought.  Publications of collaborators and friends of Joan Bardina Studies Centre.  Videos documentaries from the work of Agustí Chalaux.  Other political and economical suggestions. A short history of money. An instrument to build peace. Semitic legends concerning the bank. Telematic currency and market strategy. (Archaeology. May/June 1979, Vol. 32, No. 3, p. 22-31). Text and images proceeding from web of the Finaly School (http://finaly.org). Reckoning—how people count—is an intellectual endeavor that on occasion can be demonstrated archaeologically. Bone artifacts bearing incised markings seem to indicate that ancient Palaeolithic people had devised a system of recording as early as 30,000 to 12,000 years ago. When first discovered in French cave sites in the late 1800's, the notched bones were immediately identified as mnemonic devices. They were interpreted as hunting tallies and the notches were thought to represent records of kills. In a recent analysis of several collections of these artifacts, Alexander Marschack of the Peabody Museum, Harvard University, noticed that the markings are not randomly carved but are grouped in sequences of recurring numbers which coincide with the number of days included in the successive phases of the moon. Marschack argues convincingly that the incised bones represent lunar calendars, recording periods sometimes as long as three years. If his theory is correct, then tallying (from the Old French word tailler, meaning to cut or notch) may have been the first recording method used by ancient people, the earliest notations being concerned with the reckoning of time. 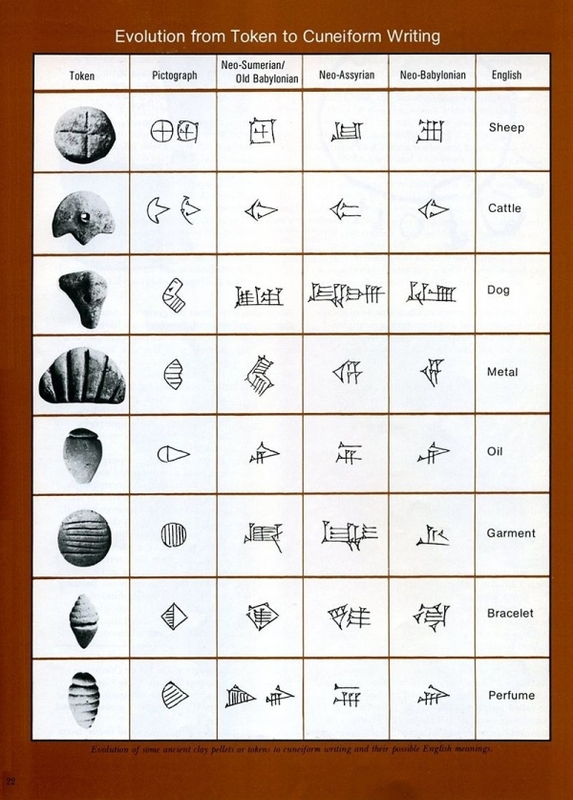 Evolution of some ancient clay pellets or tokens to cuneiform writing and their possible English meanings. These bone tallies were based on a one to one correspondence between symbols and the events or objects recorded. A major limitation of this system was that it could only deal with one category of items at a time. It also lacked flexibility because the notches were permanent and could not be rearranged. But this quality of permanence made it possible to illustrate sequences of distinguishable marks which could then be placed in «sets» and «matching sets», ultimately leading to the conception of numbers. The retreat of the glaciers around 12,000 years ago robbed the Palaeolithic hunters of their main food supply as large herds of reindeer failed to migrate south, remaining confined to the present polar regions of Europe. The brilliant Palaeolithic cultures collapsed, the decorated cave sanctuaries were abandoned and all the knowledge accumulated on the incised bones seems to have sunk into complete oblivion. Since the time of the first excavations in the Middle East during the 1800's, clay tokens have been regularly collected and listed in the published archaeological findings. Probably because they were so small, plain and inconspicuous, the tokens were somehow overlooked by archaeologists. 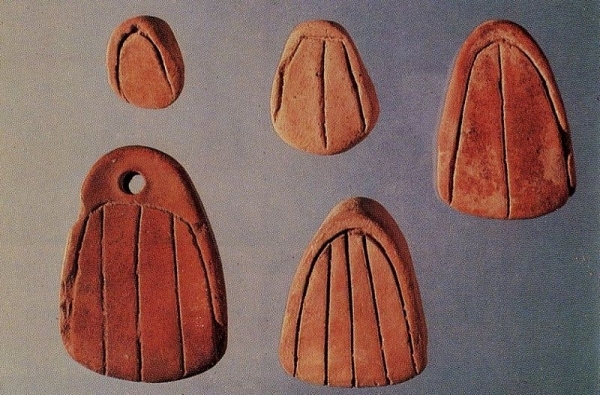 It was not until collections of clay tokens were studied as a group that it became obvious to me that these humble objects from the Middle East were somehow linked to the incised bones of Palaeolithic Europe and represented another recording method—the second evidence for prehistoric reckoning. In excavation reports clay tokens have been customarily relegated to the last chapters under the heading «objects of uncertain purposes» or «miscellaneous». No one seems to have noticed that their material, manufacture, method of firing and scale all point out that they belonged together as a set. 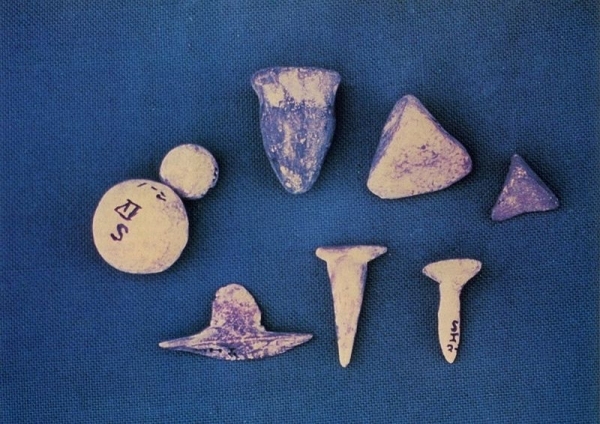 On the contrary, each particular shape was attributed a different function: the round pellets were interpreted as marbles, the discs as game pieces and the cones as phallic symbols with ritualistic meaning. Many of the clay tokens have been found in the settlement debris of ancient mounds or tells, called «tepe» in Persian and «hüyük» in Turkish. Mud houses were common throughout the Middle East. It is the custom that once a house is degraded its walls are collapsed, the spot is flattened out and a new house is built on top of the old wall using stumps for foundations. By this method the surface of the ground is estimated to rise approximately one foot per century. The imposing mound of Tell Judeideh in Syria, for example, reached the height of 485 feet after 5,000 years of occupation. Today many people still build their houses with mudbricks and cities such as Erbil in Iraq are perched on top of an ever-growing mound. Tepe Asiab, where some of the earliest clay tokens were found, is a small, low mound situated beside the Kara Su River, about six kilometers from the modern city of Kermanshah in western Iran. Excavated by a team from the Oriental Institute of the University of Chicago in 1959 to 1960, the settlement of Asiab 10,000 years ago was probably very modest: it consisted of humble round pit-houses dug into the ground, possibly covered with roofs of branches and mud. Nevertheless, its inhabitants were among the first to experiment with animal and plant husbandry, herding goats and possibly raising crops. But they still relied mainly on gathering plants, collecting river clams and hunting small game for their subsistence. The settlement of Tepe Asiab was situated in an open location and was at least semipermanent which is characteristic of these early farming communities. The remains of artifacts used in daily life have been uncovered, including a simple kit of cutting tools which consists of axes, knives and sickle blades made of flint, piercing tools made of bone and heavy ground stone mortars and pestles. A set of objects of an obviously different nature was found among these tools. About 220 small clay tokens modeled in various shapes, such as pellets, discs, coils, cones, ovoids, triangles, are part of the archaeological record. All of the tokens share a number of features, including the fine unprepared clay from which they were made. Another common denominator is their small size, which averages between one and two centimeters. Some of the tokens were almost undetectable in the clay fill of the mound. Others, red, gray or black in color, contrasted against the brown dirt. The variation of coloration is important because it indicates firing which in turn reveals that the objects performed a function of enough significance to necessitate permanence. Examination of samples under the electronic microscope and tests based on differential thermal analysis, performed by David A. Kingery at the Massachusetts Institute of Technology, verified that the tokens had been subjected to a temperature of 600º-700º centigrade. The results of this test, where powdered clay samples are placed in a source of heat at a constant rate, identify the tokens as the earliest fired ceramic objects in the Middle East. The range of 600º-700º centigrade represents the crucial point at which the crystal structure of clay is irreversibly transformed into a permanently hard material. The various colors of the tokens may be easily explained by their plobable position in the fire: red at the periphery where much oxidation takes place and gray to blackish in the reducing atmosphere of the center. The manufacture of such tokens was very simple and consisted only in rolling a small lump of clay between the palms of the hands or pinching it with the tips of the fingers. The repertory of shapes seems to be restrited to forms that emerge naturally when one fiddles with clay. For instance, the two shapes most frequently represented at Tepe Asiab are round pellets (about 100 specimens) and short coils (about 70). Discs, cones, ovoids, triangles, crescents and rectangles occur with lesser frequency. 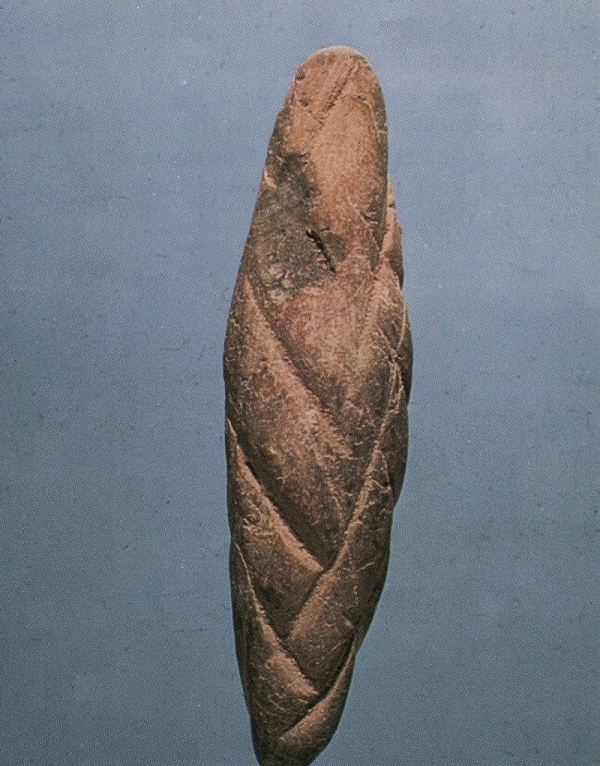 Two other shapes are somewhat more elaborate in design; the first may be described as a «T» shape and the second is a naturalistic representation of an unidentifiable animal head mounted upon a conical base. 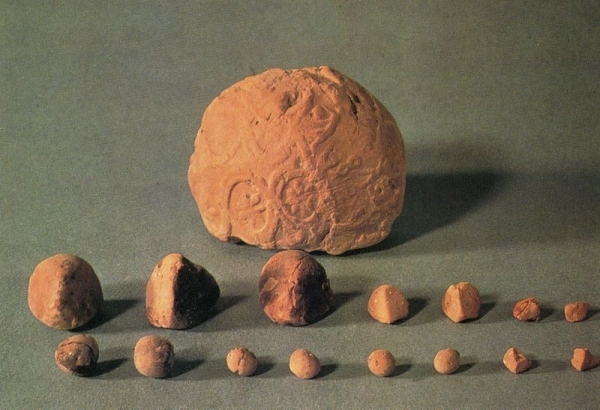 From handling the tokens one can clearly see that certain types, such as the spheres, cones and discs, were made in two distinct sizes. Half of them are very small, measuring about three to five millimeters in diameter, and the other half are double to four times larger, measuring one to two centimeters. Spheres in particular are divided into fractions, such as one-quarter of a whole round token, one-half and three-quarters. Further distinctions between tokens appear to be conferred by markings, such as circular punch marks applied with the blunt end of a stick or strokes incised with a pointed tool. 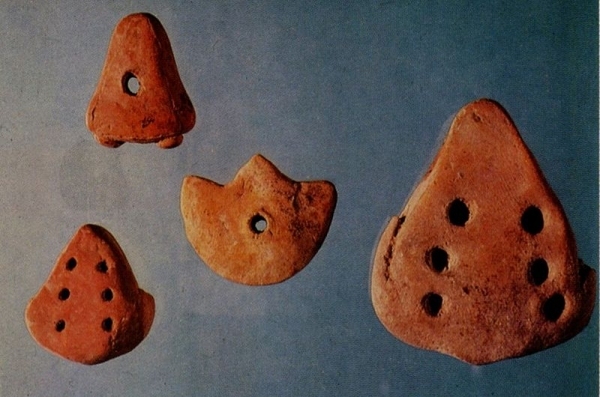 Small clay tokens of various shapes were probably invented sometime around 10,000 B.P. While they have never been found in sites prior to this date, they become a usual feature among human occupation debris after this time. Tokens also have been found in several sites contemporary with Tepe Asiab, for instance at the neighboring site of Ganj Dareh Tepe also in the Iranian Zagros and as far away as Beldibi in eastern Turkey. Their popularity continues with time and practically all excavated Middle Eastern mounds dating from 10,000-4,000 B.P. have yielded some tokens. Other sites have only produced a handful while sites such as Jarmo in Iraq, dating to approximately 8500 B.P., yielded as many as 1,150 spheres, 200 discs and 100 cones. The peak of token production may well be around 5500 B.P. when archaeologists mention that the small objects are «omnipresent» in their excavations. Impressed clay bulla with token contents from Susa dating to approximately 5500 B.P. Bulla bearing cylinder seal impression of figures. These ancient «envelopes» held tokens and were impressed with seals to identify the owners and contents. Tablet with impressed signs that may represent the number 63. Astudy of the earliest uses of clay led me to visit numerous archaeological collections and systematically record all possible clay artifacts stored in attics and basements of the major museums in the Middle East, including Aleppo, Amman, Ankara, Baghdad, Beirut, Damascus, Istanbul, Jerusalem and Teheran, and also museums in Canada, Europe and the United States. I was increasingly impressed by the sheer number of tokens and by the variety of their shapes and markings. What was most surprising was that they were present in all parts of the Middle East from the Mediterranean to the Caspian Sea or the Persian Gulf. Furthermore, tokens were also ubiquitous in time and after their appearance at about 10,000 B.P. they were present at practically all sites until the second millennium. I began to doubt that they were mere marbles and game pieces. Somehow the picture of the villagers of Tepe Asiab and their descendants spending their leisure time challenging each other at various games as some authors have suggested did not seem correct. 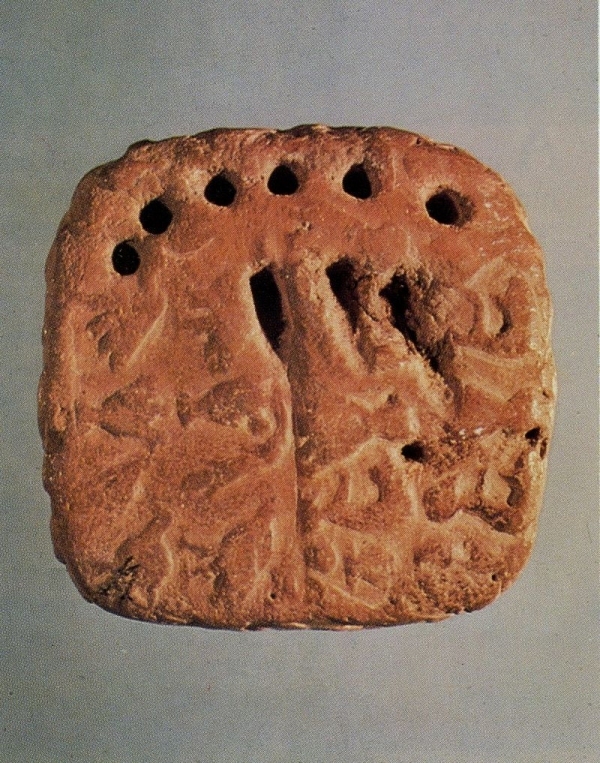 After eight years of research I proposed the theory that these clay tokens were used as an abacus and represented an archaic recording system which ultimately led to the invention of writing. The assumption that they were used in computation is supported first by the mere fact that people in various times and places have used sets of small objects to compute. The Greek historian Herodotus mentions the use of counters in Egypt and Greece. Texts and art representations tell us that the Romans used pebbles to reckon while the Chinese had ivory sticks and the Zapotecs of Mexico used cacao beans. In our modern society the abacus is still widely used both in the Orient as a business tool and in schools of western Europe and Russia to teach counting. Such devices are obviously well adapted to the need of the human mind to visualize arithmetical operations. The token system started with completely abstract symbolism, but during approximately 5500 B.P. new types of tokens appeared, including these animal heads. Triangle tokens from Susa dating to approximately 5500 B.P. Incised parabollae tokens from Susa dating to approximately 5500 B.P. The tokens from Tepe Asiab may be considered an elaboration of a system of counting based on pebbles. The novelty was to use clay for the manufacture of the counters, permitting one to model the tokens into various shapes and to assign each form a particular meaning. Thus, the counters became a more precise memory aid since they not only conferred the quantity but also the specific nature of the commodities recorded. The tremendous potential of this system lies in the fact that it was based on language and that each token actually stood for an item or word, opening a whole new avenue for communication. There is reason to believe, for example, that the token representing «sheep» was a disc with an incised cross on one face; the token for «oil» was an ovoid with an incision running along the round end. 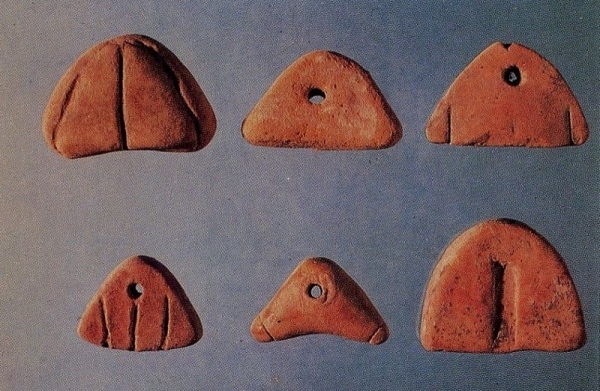 It is interesting to note that although the shapes of the tokens were mostly geometric and were easy to model in clay, they were totally symbolic and completely unrelated to the shape of the objects they stood for. This makes it virtually impossible for the uninitiated, such as ourselves, to guess the particular meaning of each token. It is also possible that the shapes of some tokens expressed number words. For instance, it seems that the cone stood for one, the sphere for ten and the large cone for 60, suggesting that people had already mastered the art of computing with real numbers 10,000 years ago. What exactly the inhabitants of Tepe Asiab deemed important enough to count and record is not easy to guess. The fact that the tokens appear simultaneously with the first attempt at agriculture may provide a useful insight. This was a time when human survival began to depend upon the accumulation of reserves during the good seasons in order to face the winter. The tokens could have been used in keeping track of the contents of silos and storage pits. Also, since sharing is characteristic of tribal societies, it is conceivable that the tokens helped to calculate and record the dues and contributions of each member to the community. The new farmers also began to rely on trade to secure necessary raw materials from distant places. The tokens may have been used in bartering flint and obsidian, shell and other coveted goods from nomadic tribes in exchange for grain and other products of the fields and orchards. This particular phase of the token system lasted for a long time, from about 10,000 to 5500 B.P. During these 5,000 years the system exhibits an astonishing stability and there is no evidence for any notable change in the repertory of token shapes. Tokens bearing punched maks from Susa dating to approximately 5500 B.P. These perforated tokens with incised rectangles were probably strung together. This was a convenient way to hold together the tokens from a special transaction or ship them to a distant partner. Group of tokens from Susa dating to 5500 B.P. including the tokens representing woman (bottom center), metal (bottom left), sheep (top right) and sweet (top, third from right). It is remarkable that the next drastic change in the token system occurred, as in the first instance, simultaneously with the second major economic «revolution» in human social development. The year 5500 B.P. 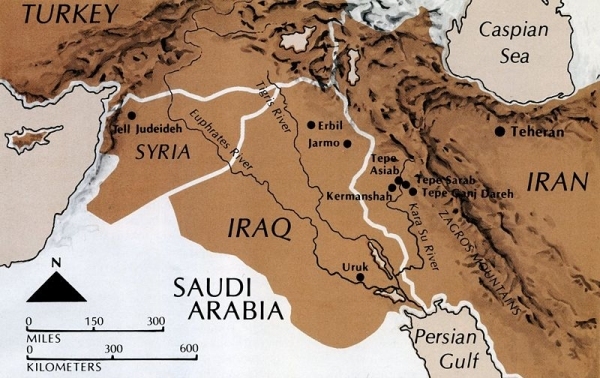 marks the emergence of urban communities in the Middle East characterized by the concentration of populations in well-watered areas that could sustain them. Scholars now believe that the former tribal hierarchy was replaced by a priestly administration or an appointed king and the citizens were divided into social classes, such as nobles, clients, commoners and slaves, all having different status, wealth and rights. A typical Mesopotamian city, such as Uruk in modern Iraq, was surrounded with a defensive wall; the visitor who entered the gate was faced with a claedalus of narrow lanes between small mudbrick houses. Along the main street leading to the center were the busy workshops of potters, stonecutters, smiths, jewelers and basketmakers. Other shops sold products from the fields, orchards and stables from surrounding villages. The spacious houses of the well-to-do were built around an inner courtyard located near the center of the city. These were the residences of the large landowners, important temple or city administrators and merchants who brought luxury products such as lapis lazuli, gold, silver and fine woods to Uruk. The temple occupied the center of the city; included on its premises were storage areas for raw materials and food products and large workshops where stone, metal and wood were processed. Group of tokens from Tepe Sarab in Iran dating to approximately 8500 B.P. Token in the shape of a cylinder that may represent a rope dating to approximately 5500 B.P. It seems obvious that in this new setting where the economy was based on the exchange and taxation of products between specialized workshops, villages and cities, and between adjacent or distant countries, new demands were placed on the token system. One may expect, for instance, that more token shapes were needed to represent the greater variety of products exchanged on the market. This proves to be the case—several new token forms appear, including rhomboids, parabollae, miniature jars and animal heads, bringing the repertory of shapes to 15 main types. The most striking change, however, is the profiferation of markings on the tokens; at least 55 percent of the spheres, discs, cylinders, cones and ovoids bear a series of incised lines or punch marks arranged in patterns and adding no less than 250 easily recognizable subtypes. Another significant change in the business carried on in ancient cities was that the transactions were often no longer performed by producer and consumer face to face but rather with the help of intermediaries. The potter distributed his merchandise in a wide radius through retailers; the farmer shipped his products to be sold by shopkeepers in the city; the ruler was accessible through administrators, and even the prayers of the gods had to be mediated through a priest or priestess. Two innovations of the token system suggest that an effort was made to accommodate long distance trade and that tokens were used to transmit messages and orders between partners situated in different localities. In fact, when the tokens represented concepts such as «sheep», «oil» or «metal», this new system could even replace verbal communication. The parties involved were not even required to speak the same language as long as they shared the knowledge of the meaning attributed to each token. The first evidence for these novelties consists of the appearance of perforations on 30 percent of the tokens, suggesting that they were strung together for transport. This system presented not only the advantage of binding together the tokens of a particular transaction but also organizing them in a definite sequence. One might imagine that such a message read «30 oil jars, 12 copper ingots» and so forth. In this instance the tokens were no longer treated as individual symbols but were organized with abstract linkage according to a rudimentary syntax. For unknown reasons this method did not entirely satisfy the ancient business world and a parallel method of exchanging tokens was devised which proved to have a greater future. A kind of envelope which we call «bulla» was developed. The bulla is a simple clay ball about the size of a tennis ball which contained a cavity created by pressing. A specified number and variety of clay tokens were placed in the cavity before it was patched up with an additional lump of clay. An estimated 300 bullae have been found in excavations from a total of nine sites scattered over a wide area including Iran, Iraq, Israel, Saudi Arabia and Syria. Their shape is usually spherical with a diameter ranging from three to nine centimeters, although some examples also assume the shape of a football. Among the recovered bullae some were broken and separated from the tokens they once yielded. Others, although crushed by the weight of the superimposed archaeological layers, were luckily still associated with their full contents. Most of the bullae have been found complete and rattle tantalizingly when shaken. X-rays have been used on some specimens to try to unravel the message the markings contain, but the tokens are so tightly clustered together that they hide each other and it is difficult to even count them precisely. It is also almost impossible to distinguish between discs and spheres and between cones and ovoids or tetrahedrons. Owing to the legitimate dread of archaeologists to destroy 5,000-year-old artifacts, very few of the intact bullae have been sawn open to check their contents. Under the circumstances one is forced to base the study of bullae on no more than 15 opened specimens. 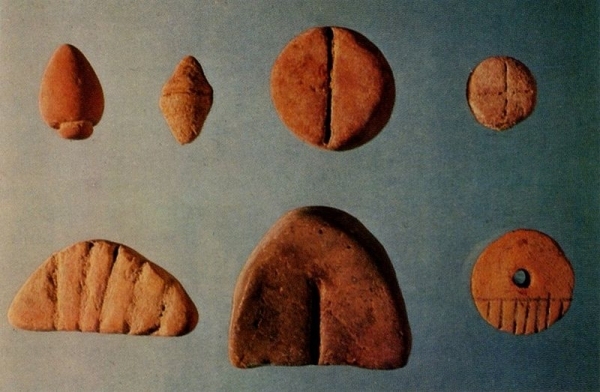 The assemblage of tokens held inside these examples include spheres, cones, discs, coils, tetrahedrons, ovoids, triangles, parabollae and several odd shapes, some of them bearing the usual incised or punched markings. There are some distinct advantages for handling the tokens in bullae rather than on strings. The sturdy walls of the bullae, some of them up to three centimeters thick, provide good protection. The greatest benefit, however, lies in the fact that bullae could bear the seals of merchants. It was the custom in the ancient Middle East for individuals as well as administrative offices to own a special small stone carved with a distinctive pattern which served as an identification mark. The bullae provided an ideal clay surface to imprint the necessary seals to sign and authenticate the enclosed message. Except for four known examples, all bullae bear multiple seal imprints covering their entire surface. This method not only provided the identification of the sender but also security against tampering. Sometimes two different seals appear, implying that not only the sender but the middleman probably were provided a warranty on the contents. A few bullae are even covered with up to three or four distinctive seals suggesting the use of witnesses. The fact that numerous bullae have been found still in possession of their contents strongly suggests that some were kept in archives. It may even be possible that a duplicate copy of each bulla sent with an envoy was held until the return of the caravans. Perhaps the bullae were also used to store other information, such as of debts, receipts for taxes and land sales. While clay was an ideal raw material for the manufacture of these envelopes, its opacity presented a serious problem. Once the bullae were closed and the seals applied, the amount and types of tokens included were left entirely to memory with no possibility of checking them without breaking the sealings. This shortcoming, however, was solved by impressing the surface of the bullae with a series of markings picturing the shape and number of tokens held inside. The markings were applied rather crudely on top of the owner seals, sometimes by pressing the tokens themselves into the wet surface of the bullae, but more often they were impressed with a thumb or a stick. A deep circular imprint stood for a sphere, a shallow one for a disc, a conical or ovoid shape stood for a cone or ovoid. These markings could be identified by anyone who understood the token system and the contents could be «read». 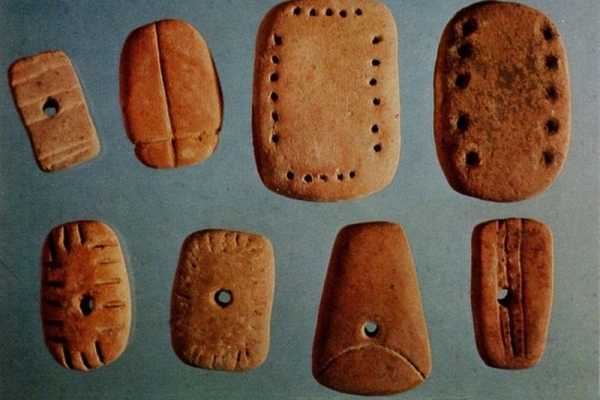 Clay tokens, often neglected in the past, led to no less than the invention of writing. The markings applied by a thumb or, less regularly, the token itself added one degree of abstraction to the previous communication system by translating the tangible forms of the tokens into a two-dimensional image. Apparently the system of abstract signs did not represent an obstacle to the ancient users. On the contrary, it was obviously a convenient accounting procedure. Soon, however, the cumbersome system of bullae filled with tokens and completed by markings became obsolete and whole tablets bearing signs made their appearance. The clay tablets closely followed the appearance of the bullae; at first they consisted of a lump of clay approximately the same size and with the same roundish or oval form, even retaining some of their convexity. The signs they bore were the circular, ovoid, conical markings identical to those on the bullae. The fact, that less than ten bullae bearing markings have been recovered at only three sites (two in Iran and one in Syria) suggests that the transition to writing was a rapid one. These impressed signs, however, did not allow for much precision and they were soon supplemented by incised signs which were able to sketch accurately the exact shape of the most intricate tokens and their particular markings. Scholars during the nineteenth century referred to these remarkably abstract signs as «pictographs», reasoning that all systems of writing had to evolve from an initial stage when signs were first pictures of specific items. In this case, however, the signs are not actual pictures or representations of the objects themselves, as one might expect, but of the clay tokens previously used. In this way the newly developed writing system was able to draw upon a pool of the already widely used symbols of the token recording system—only adding a second step of abstraction. In time the markings became more simplified and conventionalized. The use of special styluses with triangular ends is responsible for the characters of the Sumerian script and its name—cuneiform—which means wedge-shaped. The early stages of Sumerian writing are still enigmatic and the «pictographs» are still mostly undeciphered, but cuneiform writing is now well understood by epigraphists. One of the methods used to identify the meaning of pictographs is to try to trace the evolution of particular signs from the known cuneiform signs to the original pictograph through various intermediary stages. By this method we can, with a reasonable degree of confidence, assume that an ovoid with an incised line along the broad end meant «oil»; the disc with an incised cross stood for «sheep»; a cone represented the numeral «one»; a sphere meant «ten» and large cone «60». The token system and writing must have coexisted for a time, but each developed to its own destiny. Around 4700 B.P. the token system, relieved from all pressures imposed by urban demands, reverted to its former use in household and market computations. Later it continued to be used as a corollary of writing and was simplified into tokens of a single shape as in the modern abacus. Writing modeled itself more closely to language and became phonetic. The cuneiform system, of writing impressed on clay tablets continued unchallenged in most parts of the ancient Middle East until 2500 B.P. when the Persians adopted Aramaic as the official language of their empire. Aramaic used a cursive script that allowed more rapid recording because letters were connected. Eventually, the use of clay tablets and stylus were replaced by papyri or parchment and pen and ink. In most cultures the invention of writing is considered to be an event of the greatest significance and its origin is often surrounded by fabulous legends. The ancient Egyptians believed that writing had been taught to them by the God Thoth, the dog-headed baboon who was also the god of Wisdom, Science and Medicine. In Sumer it was known as the revelation of the Goddess Nisaba, the wife of the lord wind Enlil. In our own society writing is viewed as the landmark for civilization and history. Until today its invention has been fancied as the intellectual achievement of a group of wise men in Sumer who systematically decided upon a number of pictographs to represent desired concepts. My research demonstrates that, like all other human achievements, the origins of writing are humble and fortuitous. 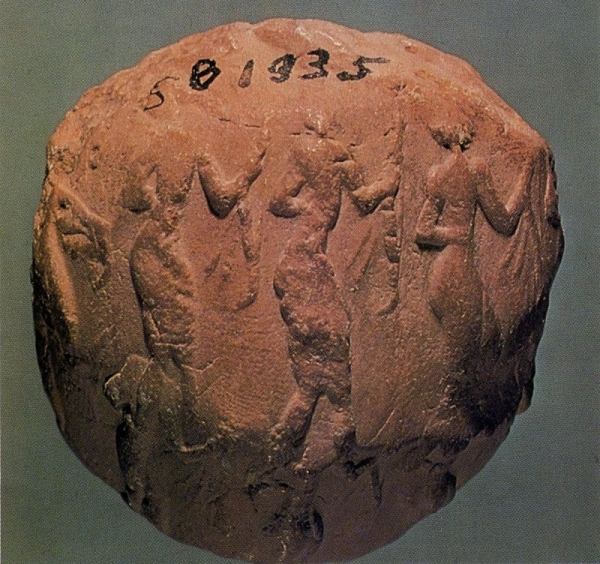 Writing did not come ex nihilo, but rather was a step in the evolution of a previous recording system based on small clay tokens which had been in use for millennia in the ancient Middle East. 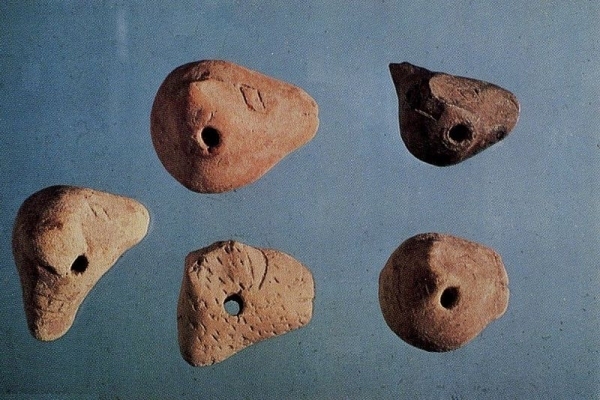 FOR FURTHER READING on the theory of clay tokens as the precursor of writing: Denise Schmandt-Besserat, «The Earliest Precursor of Writing», Scientific American 238(1978):50-59; «An Archaic Recording System and the Origin of Writing», Syro-Mesopotamian Studies 1(1977):1-32; «An Archaic Recording System in the Uruk-Jemdet Nasr Period», American Journal of Archeology 83(1979):19-48; «The Earliest Uses of Clay in Anatolia», Anatolian Studies 27(1977):133-150; «The Earliest Uses of Clay in Syria», Expedition 19(1977):28-42; «The Beginnings of the Use of Clay in the Zagros», Expedition 16(1974:11-17. On the history of writing: Robert Claiborne, The Birth of Writing (Time-Life Books, New York 1974), the most recent book on the topic which still includes the old theory of writing deriving from pictures; Alexander Marschack, The Roots of Civilization (New York 1972), presents his bold interpretation of incised Palaeolithic artifacts as sophisticated lunar calendars; J.M. Pullan, The History of the Abacus (Praeger, New York 1970), documents the major role played by the abacus for computation dating from classical times to the French revolution. On related excavations: Pierre Amiet, «Glyptique Susienne», Memoires de la Delegation Archaeologique en Iran, Vol. XLIII (Paul Geuthner, Paris 1972): Vol. I, 60ff and Vol. II, PL. 61ff; R.J. Braidwood, Bruce Howe and Charles Reed, «The Iranian Prehistoric Project», Science 133(1961):2008-2010; H.J. Lenzen, «New Discoveries at Warka in Southern Iraq», Archaeology 17(1964):122-131; Ernest MacKay, Report on Excavations at Jemdet Nasr, Iraq (Field Museum of Natural History, Anthropology Memoirs 1:278). Schmandt-Besserat, Denise. «The Earliest Precursor of Writing», in Scientific American, June 1977, Vol. 238, No. 6, p. 50-58. Friberg, Jöran. «Numbers and Measures in the Earliest Written Records», in «Scientific American». February 1984. Volume 250. Number 2. Pages 110-118. Schmandt-Besserat, Denise. «Two Precursors of Writing: Plain and Complex Tokens», in The Origins of Writing / edited by Wayne M. Senner. 1991: 27-41.